The thrilling competition in the KTM RC390 Cup Asia at the Sepang International Circuit continued to intensify in Round 3 with our very own Ralph Kenneth Torres, KTM Philippines-sponsored rider, placed a respectable 5th place over 23 other racers during race 2, which commenced early on Sunday of July 30, despite failing to finish in the first day of the cup due to technical issues concerning a flat rear tire. In a Facebook post following the race, Torres shared that “[It was] a tough weekend race for me” but was still grateful for having placed 5th and was thankful for the full support he received. Round 3 of the KTM RC390 Cup Asia saw racers from Malaysia, China, Japan, and the Philippines in intense completion, with M.Izam Ikmal Izamli, Ahmad Daniel Haiqal, and M. Ibrahim Mohd Norrodin, all from Malaysia, taking the top slots. The next round of the KTM RC390 Cup Asia will be held from 15-17 September, with riders set to face a slightly different challenge at Sepang, racing around a specially designed North Circuit instead of the full circuit. KTM will also continue to feature wild cards and special guests as learning opportunities for the riders to see what the RC390 is capable of and to push themselves to improve further. Started last March and culminating in November this year, The KTM RC Cup brings to the region for the first time one of the most anticipated and exciting international motorcycle racing series that is catching Europe and the Americas by storm. The event sets out to support promising young riders by equipping them with the necessary skills to become truly ‘racing ready’. 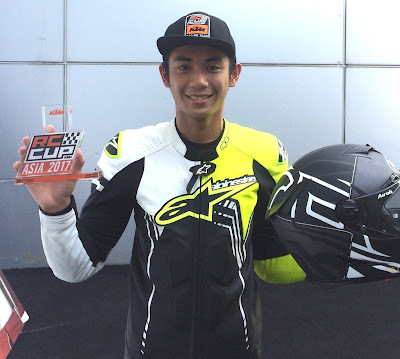 Torres’ participation in the exhilarating KTM RC Cup Asia is in keeping with the strong racing DNA of KTM motorcycles, all ready-to-race and built on the core values of purity, performance, adventure, and extreme. From 1953 when KTM was first founded, KTM motorcycles have since participated in many top races, both Rally and MotoGP, winning awards, recognition, and acclaim.